An exciting feat of heroism, of swashbuckling, and of negotiation! The brave heroes have been mustered to accomplish the unthinkable: defeat the dread ice dragon! This and other goal-oriented games await the children in an active, outdoor activity. Children work together as a team in a non-competitive story game as they battle against foes and emerge the heroes of a great quest. 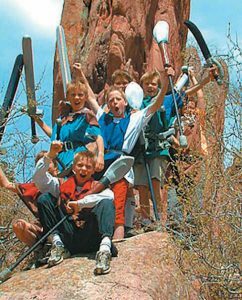 Like Adventure Quest, there are some dilemmas and brainstorming involved in the Hero Games, but the participants do not choose mythical archetypes, do not make decisions that affect the quest, and do not undergo the mental challenges that sometimes arise in a quest. 1 hour: $140. Up to 10 children.